Every company has one, and telling it in an interesting, meaningful way is critical to your success. This quick-read resource outlines an easy-to-follow approach to developing your story to ensure it makes an impact with customers and prospects. If buyers and potential buyers understand who you are, all that you offer and why you're a good partner, you will increase the likelihood of earning their business. 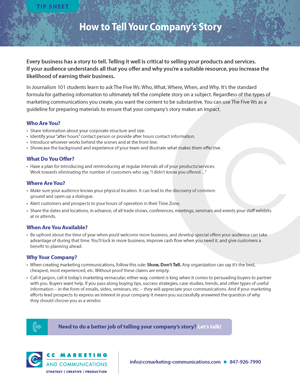 Download How to Tell Your Company's Story today and get ready to share what makes your company special!